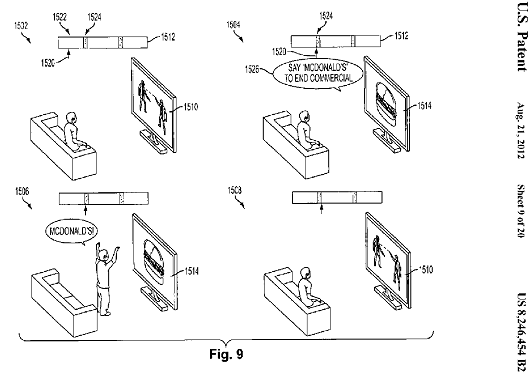 Sony holds the patent for turning television commercials into interactive video games, taking humanity one step closer a future resembling Wall-E, while the likelihood of Blade Runner fades to a distant, neon second. The patent describes one method of gaming as advertisement as a "commercial overlaid on frames of the television program allowing the user to play the game while the television program is displayed." Sony's patent provides visuals of various implementation processes, some of which include using the PlayStation console itself, along with the PS Eye, the Move or DualShock controllers, or a microphone. The controllers would allow viewers to play mini-games designed to sell products while they entertain, and they would enable people to purchase items directly from the ad. One drawing shows someone ordering a pizza by using the Move to select a large "Buy" button, and another has someone voting for a character with the X, O, square and triangle buttons. The patent also shows a microphone hooked up to the PlayStation console, enabling viewers to vocalize whether they want an action or romantic commercial. Another voice-input idea makes viewers yell out brand names to continue their shows, pictured above. The patent appears to work with internet TVs or screens attached to network-enabled devices, such as the PlayStation. If you've yet to disable your cable and hook up your PC to an HD flatscreen, now may be the time – or maybe consider that Steam Big Picture box when it launches. They can take our TVs, but they'll never take our PCs.